This delicious combo from the mind of Luke Watson brings together 100% beef, cheese with peppers, bacon, sliced onions, chopped iceberg lettuce with jalapenos and piri-piri mayo bringing a little heat to a chilli, chive & sesame-topped bun. Price: £3.99 for the burger only (subject to variation). 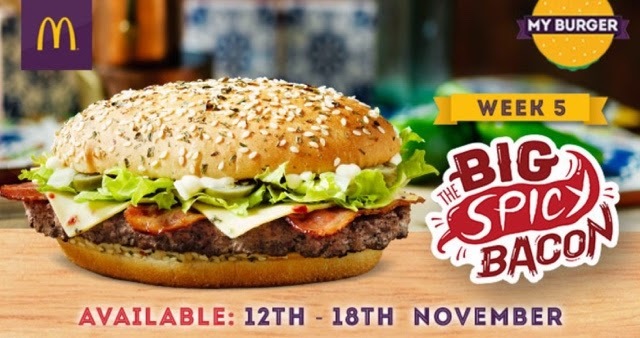 Welcome to the fifth and final instalment of the McDonald’s My Burger promotion and what an excellent five weeks we’ve had trying each of these crowd-sourced burgers. 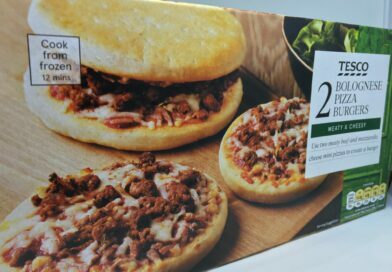 You’ll have to accept my apologies for my review of the McPizza Pepperoni as I was feeling unwell that day and didn’t feel on top form. 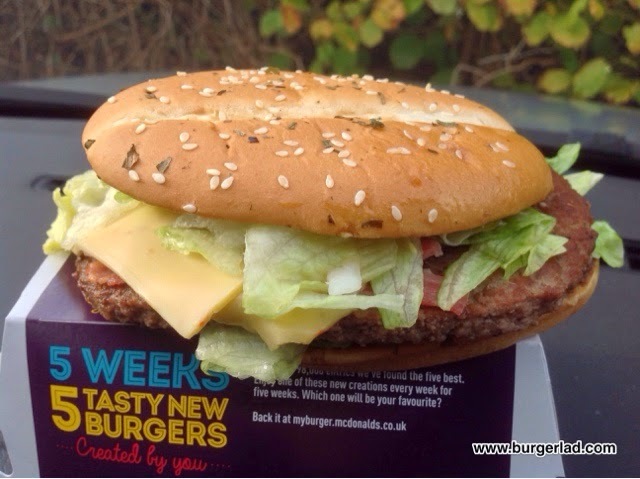 But this week Burger Lad® is back to his brilliant, burger best and concluding My Burger is The Big Spicy Bacon. 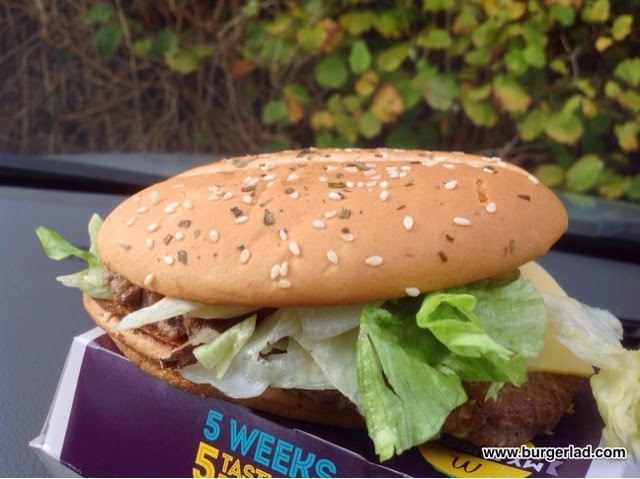 In my opinion this is the best sounding of the five and is the first McDonald’s UK burger to feature jalapeños on it. The USA get the Jalapeño Double and Burger King have had the spicy, pickled peppers on their Angry range so I was very much looking forward to trying The Big Spicy Bacon. As you may or may not know I’m quite a fan of Nando’s Peri-Peri sauce (when it’s not down my shirt) so the promise of a McDonald’s piri-piri mayo was intriguing. 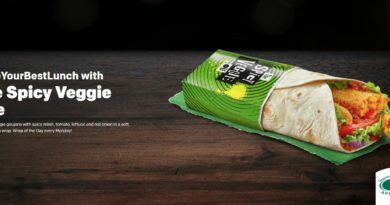 This, plus the additional chilli, chive & sesame-topped bun, cheese with peppers and jalapeños threatens to make this the spiciest entry on the UK McDonald’s menu ever… just how would the heat levels compare to the Sweet Chilli Fiesta…? Hot off the heels of our Firefly Pastrami Swiss review we hit the drive-thru relatively early and had the usual wait. I even managed to drive away from my secret burger location with The Big Spicy Bacon despite being told the Big Tasty with Bacon is no longer on sale anymore. Perhaps in the excitement I was mumbling my words. This had been made-up well today and there was an abundance of lettuce on-board, it practically fell out the chilli, chive & sesame-topped bun it was that packed with it! I took my first expectant bite… and it was a satisfying crunch delivered from that lettuce. This coupled with the onion slices gave the burger a fresh tasting platform for the rest of the ingredients to build on. Now there wasn’t much of the onion on my build so after the first mouthful or two I didn’t really pick up that sharp taste again but it was good and I think more would have possibly detracted from the spicy elements we’ll discuss next. This burger was loaded with jalapeños and this was a joy! I was expecting maybe four slices maximum but I literally counted eight, maybe nine of them so this was definitely a positive for The Big Spicy Bacon. I did remove one to see just how spicy they were and am pleased to report back they did provide a suitable kick. I hope in future promotions we get to see them return. The bacon was there, it did contribute to the burger overall with that chewy texture but was fairly flat in terms of flavour. 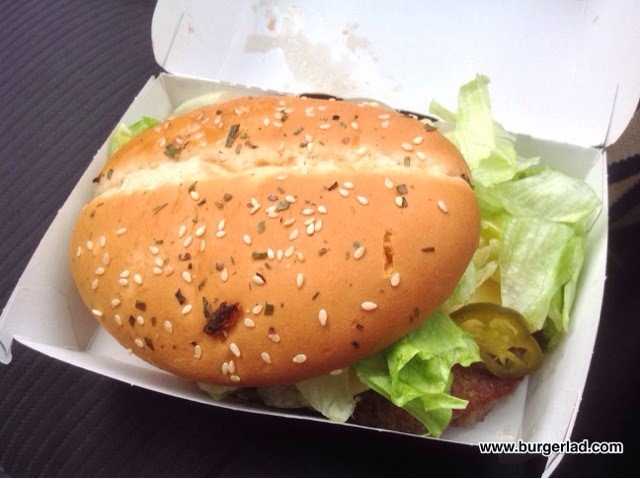 Still, it worked nicely with the 100% beef patty and those cheese slices with pepper – again I would like to see more pepper flecks in the cheese. 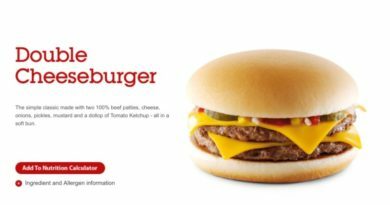 Speaking of the cheese, when you manage to grab one of these burgers without the dreaded burger slide the cheese sits nicely, not melted and not looking a million miles away from the promotional picture. 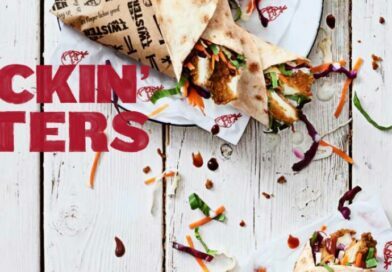 Alright Mr. Nando’s so how did that piri-piri mayo measure up…? To me this could have had more of a stronger peri flavouring to it… but then I am used to Extra Hot in the morning because I’ve been branded a loose cannon in the past. It definitely provides a slight spice level to The Big Spicy Bacon and is obviously something different to what we’ve seen before. Overall, The Big Spicy Bacon does exactly what it says on the tin. OK perhaps it’s not majorly “big” but weighing in at 648 calories it’s certainly got some weight behind it. The jalapeños are the star of the show on this burger and as a whole it really works with that crispy and fresh onion/lettuce combination while giving carnivores their satisfying fill with the bacon and beef. Cheese works too, to give us that bacon cheeseburger experience but it’s the piri-piri mayo and jalapeños that just takes it up a notch or two above the Big Uno and Ultimate Supreme. 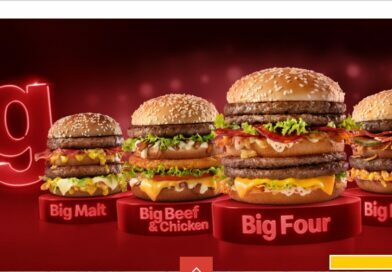 What a fantastic end to the five week My Burger promotion from McDonald’s. I think The Big Spicy Bacon will be hard-pushed to give the McPizza Pepperoni a run for its money but I’d just like to add a personal congratulations again to the final five. It’s been an absolute blast reviewing your burgers! We’ll be updating our original My Burger Winners post with the taste test analysis for all five promotional items within the next 48 hours… in the meantime we’ll leave you with our latest episode of BLTV. This burger was ace! Really fresh and crisp flavours (wimped out of ordering one with mayo on, sorry!) and I LOVED the jalapeno peppers. 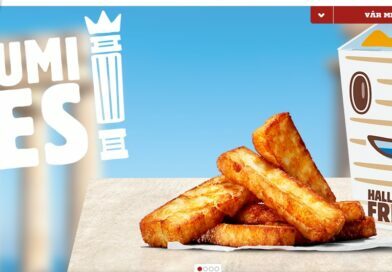 McDonalds should use these on burgers more often in my opinion and it'll be a real shame to see them go. Overall verdict? It was big, it was spicy, and it was….filled with bacon. Did exactly what it said on the tin (unlike others, mentioning no supreme names, ultimately) and was downright tasty. Good work! Ah, BurgerLad, el gringo he is lacking in the imagination! We know the chilli she is supreme, yes? Also I see you give good reviews to not so spicy burgers, so he make no sense. Ay, he is not reading all your reviews, eh? ¡Jajajaja! This one gets my vote too. Love your words. The pictures they make me hungry! Well…. 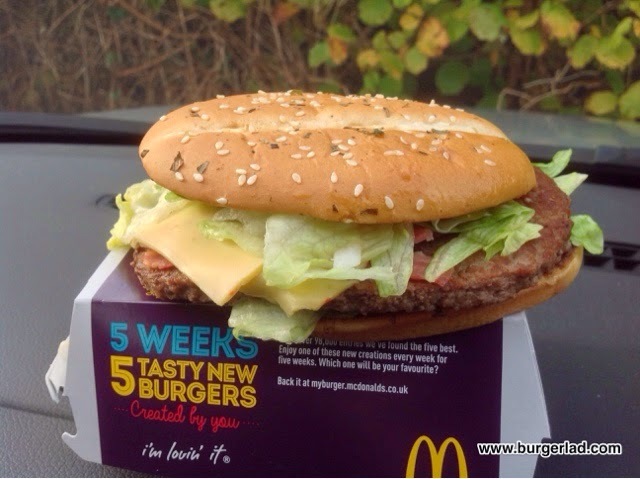 week 5 and my final review of these McDs people burgers. 5 weeks ago, I was almost a McD virgin (about a 15 year gap between my previous one), so was both nervous and excited about trying these. Originally I was going just to try the one, but thought I would stick to all 5 and provide a review for this excellent website. So the last one… the Big Spicy Bacon. Rolled up on Wednesday to my usual drive-thru in Oldbury and for once I had a perfect build – all components were there – including about 7-8 chillis! 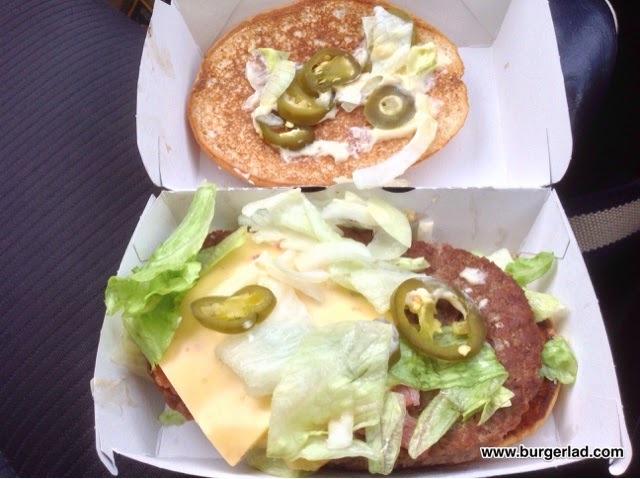 The first bite was amazing – lovely crunch of the lettuce and onion, with the sharpness coming from the chillis. The patty was pretty good this week and the cheese had a good flavour. I wouldn't say there was too much heat from the chillis (just a mouth tingle) however the flavour they added was amazing. The bacon wasn't too fatty and added a nice taste to the burger. Could I eat another one? Yes. This actually pipped the McPizza to the post (sorry Charlotte! ), but everything just seemed to work on this one, especially the lovely taste from the jalapenos. 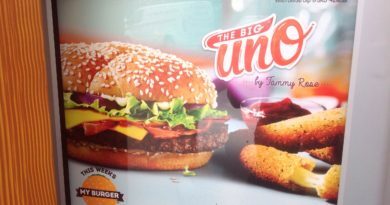 Looking back at week 1, I remember being most excited about the McPizza (it sounded different) and was nearly an amazing burger (see my comment in Burgerlads review of it) – the Ultimate Supreme and Big uno sounded pretentious and play it safe. I didn't really pay much attention to the Spicy Bacon – maybe because the other 3 all had bacon in it?? But I was taken back by this one as how nice it was. I'm going to leave highstreet burgers alone for a bit now…. hopefully Burgerlad will let me post a few guest reviews of gourmet burgers in the meantime! I think Pointless Drivel should be my next Twitter name.